You come home late from a party, sit down on the couch to wind down, and after flipping through all the channels several times, there is nothing good on. But the wacky man in a question mark jacket, trying to sell his book on an infomercial, catches your eye. What else are you going to do? There is nothing else on TV. So, you sit there and watch, intrigued and very interested. But it's an infomercial, most likely a scam to get your hard-earned money. Or is this really a way to get free money? The man in question is Matthew Lesko, a best selling author who has written a book entitled Free Money To Change Your Life: 15,000 Government Programs To Get A Better Job, Start A New Career, Get An Education or Follow Your Dream. After reading through this book, I will tell you this, there are no get-rich-quick schemes and owning this book is not going to make you instantly wealthy. However, that does not mean this book is a waste of money nor a waste of your time. With over 1,130 pages of detailed government programs, Matthew Lesko (with Andrew Naprawa and Mary Ann Martello) offers up several key pointers that will help you succeed. Chapters like "Look At All The Stupid People Doing Well", "Giving Is Selfish", "Bigger Isn't Always Better", and "Enthusiasm Is Renewable Energy", to name a few, will give you tested and perfected advice on business and life. The book offers up thousands of programs for every state, including ways to buy a house or property with bad or limited credit. Wealthy, undiscovered loan programs waiting to be solicited to help you start your own business or buy your dream house. And free educational and training information to get you a better job. With so much information, the book, retailing at $40.00, is a steal. It is a bona fide good deal. Especially if you're looking for information on your competitors (how to obtain free reports on your competitors is detailed in this book), information on your own credit, looking to buy a house, wanting to start a business, or in need of more capital to expand your current business. The bulk of this book is under publicized loan opportunities ready for you to take advantage of. There are several grants in here as well, especially for single parents looking to go back to school. 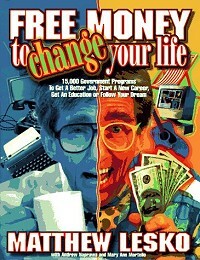 The infomercial will lead you to believe that the government is giving away free money to help your career. This is not entirely true, but isn't entirely a lie, either. There are programs in here for certain states where you can obtain a $50,000 low-interest loan to start a coffee shop. Grants to help certain people find a new career path. And plenty of small town grants and loans available for those that want to enrich and build up a small town's economy. Though the average Joe off the street may not be able to pick up this book and find something that is immediately beneficial, this is a great resource book to keep on hand, as well as a great educational tool. With enough content alone worth the $40.00, explaining strategies of why failure is good, why assets are traps, and how to train for chaos, the added bonuses, which are the bulk of this book, are a fun read at the very least. A fun read which could potentially help you buy your first home for your family, go back to school, find a new career, or open up your own business. For musicians, there are several study and teach abroad programs here. Government grants for you to go over and teach music and art to people overseas, or to just go overseas to learn, in hopes that the information you bring back to the states will help you in your career.